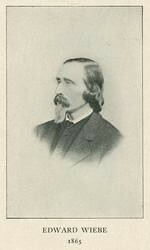 One of Wiebé’s notable contributions to Vassar was his composition of the music for a song written by special student Julia Tutwiler or the first Founder’s Day in 1866. He played the organ while the students sang as Matthew Vassar approached the college. According to his granddaughter, Minnie Wiebé, he also wrote the music for a song by Sarah Stilson’69, a student friend of the Founder, and sang with her during the festivities. Edward Wiebé died in 1885, at the age of 69. Warner, Martha S. “Letter to mother,” November 1865. Forbes, Elliot. A History of Music at Harvard.Cambridge, Mass., 1988. Norris, Mary Harriot. The Golden Age of Vassar. Poughkeepsie: Vassar College, 1915. Wiebé, Edward. The Paradise of Childhood: a manual for self-instruction in Friedrich Froebel's educational principles, and a practical guide to kinder-gartners. Springfield, Mass. : Milton Bradley & Company, 1880. Wiebé, Edward. “Wiebe’s Music for the Million: A Series of Popular Songs, Ballads, Waltzes, Polkas, Duetts, etc.” New York, 1857. Woods, Frances A. Earliest Years at Vassar: Personal Recollections. Poughkeepsie: The Vassar College Press, 1909.